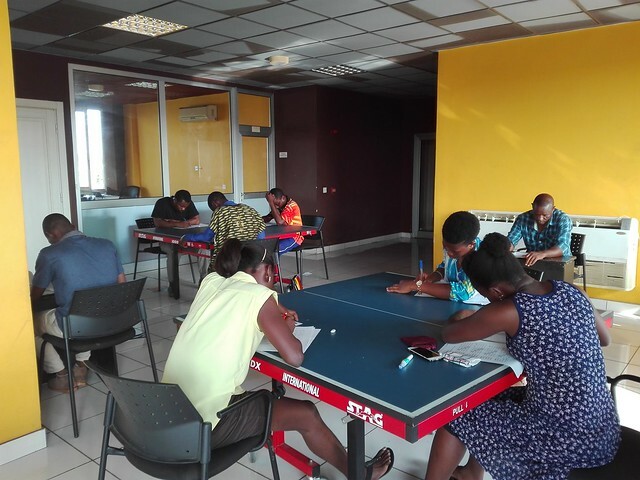 Located on the Atlantic coast of West Africa; Accra, the capital city of Ghana was the recent home for a combined Basic Umpires, Basic Referees and Tournament Organisation Course. Organised under the auspices of ITTF High Performance and Development, intended originally only for women, eventually demand meant that the initiative was opened to all; overall 11 women and 25 men attended. Led by Belgium’s Isabelle Beumier, the first step was to present the new adaptation of the Basic Umpires Course; the changes that have been made met with the approval of all, in particular Ana Ampah was impressed. Theory sessions completed, all had the opportunity to officiate in a league competition; a fact that pleased Cynthia Kwabi. Overall, the level of umpiring was more than satisfactory. All showed confidence; they were respectful of the procedures and made good decisions. All the players in the tournament were advised that the officials were new umpires; all accepted the decisions without complaining. Immediately following the Basic Umpires Course, a Basic Referees Course was next on the agenda, nine candidates reached the necessary standard, one being David Senyo Ahiaba. “I am satisfied with my result. It was quite difficult but we had enough exercises to know how to calculate groups or make a draw.” said David Senyo Ahiaba. Finally, the Tournament Organisation Course gave the opportunity for all to evaluate the needs and calculate the costs of tournament organisation. Required to arrange schedules; all, in particular Timothy Abaidoo and Benjamin Edward Acquah, appreciated the practical elements. “We are so thankful to have had these courses here in Ghana. We are now looking forward the next step.” Benjamin Edward Acquah. A successful course completed; judging by the response in Ghana there more to follow.